What do I need for long-term recovery? Long-term recovery is possible with willingness, the right tools, information and help. 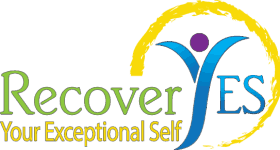 There is no one right way to recover and whatever works for you is OK. That is why RecoverYES approaches recovery from many different angles so that you can find the approach that works the best for you. Sobriety is only the first step to recovery- full recovery involves healing in all areas of life. We believe that your recovery can be easy and fun, but that it also can be hard and challenging. We believe that many people can get sober by themselves, but that full recovery often requires outside help. For those on the high end of the addiction scale, recovery almost always requires help; just as someone with mild heart disease can usually recover by making lifestyle changes on their own, while someone with advanced heart disease may require surgery, medication, physical therapy, etc. ← What do I need for long-term recovery?